Q. Why hasn’t there been any type of advertising for this great game? and when are you thinking of starting adverts. Will it be on TV, Magazines, or both? Q. What platforms will Trespasser be available on? -A. Trespasser is a PC only title. Q. Are the graphics as good as Unreal or Prey? – A. Totally different, more real. Q. Will there be a shareware version? – A. Sorry, the data sets are far too large to make a shareware version possible. .. It would be like trying to release a shareware version of Myst! Q. Will there be multiplayer capability? – A. No, it’s really being developed as a single player game and multiplayer simply doesn’t fit into the development schedule. Q. What about force feedback joysticks? – A. If we have time and the demand presents itself. While Trespasser isn’t a game designed for joystick use, most will be generically supported through Direct Input, but force feedback requires some additional work. Q. Is everything true 3D? Q. Do I need a 3D accelerator to play Trespasser? – A. No, Trespasser will include all the features in ‘software only’, if a 3D accelerator isn’t present. Q. Will I see a performance improvement with a 3D accelerator? Q. Will you be able to hide “in front of” the dinosaur, ie. If you were being chased by a T-Rex and you were able to gain a little ground some way and you hid behind a tree. 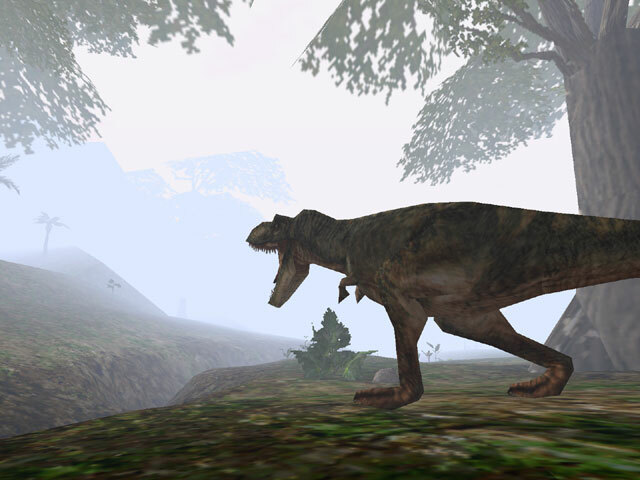 Would the T-Rex “know”(like in Quake) where you were or would he “think” you were in the area and begin to roam? – A. You’ll definitely be able to hide from the Tyrannosaurus — all the dinosaurs are being implemented as much as possible like real animals with real senses, motivations, etc., as opposed to traditional video-game opponents, who just walk straight toward you. So yes, you’ll be able to hide, and the T. Rex will hunt for you. In fact, faced with T-Rex, we recommend this course of action. Q. In theory would it be possible to destroy the island. By that I mean take down every tree and building? – 1) technically, it would take too much memory to record the new position/status of every single tree, building, etc. on the island — the island just has too much stuff on it. – 2) the game is built very realistically, so you can’t do things you wouldn’t be able to do in real life. Some of the buildings are reinforced concrete, some of the trees are giant 2-meter thick redwoods. So without some hefty explosives, you wouldn’t be able to knock them down anyway. Q. Will you or the Dinosaurs “bleed” and if so will it flow, or appear like in quake? – A. We’re still tossing around various ideas about how to do bleeding; but it’s pretty unlikely we’d do any kind of flowing blood — too complicated to do, and too, well, cosmetic. We’re giving priority to things that actually impact gameplay. Q. Will dinos recognize stuff you “make”, like a trap or something, as not being normal? – A. No more so than a normal animal would — animals don’t have a real instinctive aversion to traps in the real world, unless they’ve encountered them before. Q. When you are on a shore of the island(Assuming the island is not cliff-faced to the ocean everywhere) will the waves crash onto the shore or will the water just be there, as in a lake/pond? – A. That’s still an unknown right now. Our current water simulation is better than anything out there, but I’m not sure how far we’ll be able to take it. Q. Will any part of the game be modifiable, as in quake? – A. You’ll be able to set a lot of the game options, of course, but we have no plans for anything like the extensible system Quake has. Q. Is there a rating for Trespasser yet? Q. Can you swim in the water or Underwater. – A. No, we decided against it. The player can wade through water, but to let them swim in the ocean is impossible to do realistically. At some point, you have stop the player from swimming across the Pacific. Q. How long will us UK fans have to wait AFTER its released in the US? – A. It is going to be almost a simultaneous worldwide release so you won’t have to wait long at all. Q. Will the Dinosaurs, when you kill them rot & decay or disappear after you kill them? – A. You won’t be there long enough to see the corpse decay. The dinosaurs will remain after they’re killed. Q. Will there be Spitters? – A. No, that species wasn’t developed on Site B, only Isla Nublar. Q. Can fires be made in the game? – A. No, we only had time to choose one (fire or water) to represent realistically. Trust me, the water will absolutely blow your mind. – A. Mouse and Keyboard. Q. If there is no force feedback for Trespasser, will there be a Patch after the release? – A. If the demand is there… absolutely. Q. During the game, will there be any stampedes of dinosaurs? So in other words, you are walking through a large, open field, when the round begins to rumble and suddenly a large herd of dinosaurs runs through the field smashing everything in its path.? Q. I read an article about the game in which it spoke about mountains on the island. Is this statement accurate? – A. I’m not sure what article it was, or what the context was, but yes, there is a mountain on the island. A volcano, in fact. Q. This question involves the video with the raptor. In that video, the raptor attacked Anne at a very high rate of speed. Will this happen in the game? Will you be standing around minding your own business, when you quickly turn around only to see teeth and claws? – A. Dying instantly from a sneak attack sounds like bad gameplay. But as we know from the movies, raptors are clever. You’d have a chance to hear it sneak up on you, so you might have a second to prepare. I’m into the idea of making players improvise quickly in a combat situation. Q. What are the brachiosaurus like? Can they step on you? Can you run under them? – A. Like all our dinosaurs, they can be seen from any angle – above, below, etc. They are unthinkably huge, and fairly placid at first. They pretty much crush anything, not always on purpose. You wouldn’t want one mad at you. Q. A lot of people are wondering about the movie clip of trespasser which shows you a T-rex knocking down a drinks machine. Could you tell me if that was from actual game play, or is pre-rendered, or is it scripted using the actual game engine? – A. A bit of everything. That’s our engine rendering an early T-rex cycle. He was coded to do just that when we started testing our AI. Aside from the shack, up close trees and soda machine, everything else is a bitmap. We actually render that scene with all 3D objects now, but the T-rex is different. Q. What systems (all details if possible) are you actually programming/play testing trespasser on? – A. We develop on a dozen different machines. Most the designers run 200MHz Gateway’s… programmers use a wide variety of AMD, Gateway, HP, Dell & Compaq’s with different configs…. most artists use Intergraph’s with a ton of memory, while a few ‘world builders’ use dual 300 Intergraph’s with 512 meg’s (they’re constantly exporting a few hundred thousand objects).. sound design uses 200MHz Gateway & 233MHz AMD K6+… physics programmer uses everything you can imagine (Dec Alpha, Digital notebook, AMD K6+, yada yada). Any possible config you can think of… we’re running it. Q. Will we be able to play the game in third person such as Tomb Raider or see it in 3rd person when we get eaten by the dinos? – A. No. If we have time, we’ll have a death camera though. Q. Can we combine two or more objects to make a weapon, for example combine a knife with a long branch to use as a spear? Or say we have a rock and a vine, can we combine them to make somewhat of a weapon? – A. That’s getting a bit complicated. However, you can do things like stack a bunch of oil barrels and shoot out the bottom one when a raptor comes close,… or use a gun to shoot at a dino, hit the dino with it… or throw it at the dino. Stuff like that. Q. Can trees be knocked or cut down? If so, can a t-rex knock one down by it’s own weight when it falls? And also, can a raptor or any other dino get hurt or killed if another dino falls on them? – A. You cannot knock down trees, but huge dinos can. Q. Knowing that there will be at least 5 different types of dinos with their various tribes as of right now. How many more will you guys plan to make before the release of the game? I know it is a hard question to answer, but are you guys constantly finding different ideas and sketches for new dinos or will there be only five? – A. Hard to say… you’ll have to wait and see. Q. Any news on whether carnivorous dinosaurs will eat other dead dino’s? Will the smell / sight of corpses attract scavengers? – A. Yes, they will attack and eat each other. Q. Can corpses / parts of corpses be moved? I would have thought that this issue opens up some serious gameplay potential, for ambushes, dino distraction, etc. 🙂 Also – will it be possible to track (if only to avoid going the same way) the dino’s? – A. Well, you can observe them and try to follow them without their knowledge… good luck. Q. Will they leave spoor / leave broken trees and smashed objects in their wake? Or will this prove too processor-hungry to implement? – A. Probably won’t be knocking over trees… but objects they run into, fall on, step on, will take damage. Q. Will the dino’s be able to track you – for example if you’re wounded, or if you’re down-wind from them? – A. Wind doesn’t really come into play. However, they will track you down by scent and more importantly, sound. Q. How will replayability be after we beat the game? Is the world randomly created each time we start a new game? Are puzzles different, what about objects, animals, are they randomly placed in the game world each time we play? – A. Well, the geometry of island remains the same. It’s really up to you in regards to dinosaurs. How you behave, where you go, and what you do changes the dinosaurs behaviour. It should have the best replayability of any 1st person, adventure game. Q. How will save game be implemented? I assume there is only one life in the game, can we save anytime we want? – A. Similar to Quake 2 or Tomb Raider 2. You’ll have an allotted number of slots in which to save your game at any state. Q. Will you be releasing any movie clips of Trespasser? – A. Before too long,.. something may pop up. – A. It’s an issue we’ve been discussing for several weeks. If we have the time,… definitely. Q. Any news on Force Feedback Support (Microsoft) yet? – A. Funny you ask,… This morning, I told the lead programmer to give me a final answer. Q. Is there any Rendered Cut scenes? – A. Yeah,.. they’ll be an introduction and ending cut scene. Q. Lots of people out there are worried about the System Requirements. I was wondering what CPU would be Required IF you used a ‘3D card’ instead of ‘a decent video card’? – A. You’re still in the same CPU ballpark with a hot 3D card. Trespasser is ALL physics,… thus really difficult math. A fast processor, with a solid floating point is needed. Fortunately, both Intel and AMD (with the new K63D) have very fast floating points. Q. Have you decided which 3D card would have Native support? – A. Nothing definite yet. If I had to guess,… 3Dfx. Seriously,.. that’s all speculation. If we find that the Power VR or a Rendition chip yields the best results,… that may win out. I’ll let you know. Q. Can there be any type of explosions in the game (i.e. shooting an oil drum and causing it to explode)? – A. We’re not having fire or explosions in the game, because we can’t really model them realistically enough — i.e. explosions in real life could drastically alter terrain, set fire to forests, etc. It’s pretty much our rule, unless we can do it like reality, we won’t do it. Q. Is there any part of the island where you cannot walk (mountaintops, large hills, rivers, etc…)? – A. The only places you can’t walk are where the land gets too steep. Otherwise, you can go anywhere. Q. I heard that the island was 15 square kilometers (9 square miles). Let’s assume that the island had a diameter of 3 miles. Wouldn’t it take about an hour to walk across it if you did not have to stop at all (which will be very hard due to the fact that dinosaurs are trying to eat you)? – A. Pretty much true, if the island were flat. But there are a lot of ridges, hills, walls, etc. that slow you down, or guide you in different directions. Some areas you have to stop and investigate thoroughly, before you figure out where to go next, and how to get there. Q. Can Anne do things like lie flat on the floor in order to hide from a dinosaur? Can she crawl? Also, can you change the speed at which she moves? In other words, can she walk and run? – A. Anne can crouch, walk, run, and jump. Q. Can you stand on top of buildings? – A. Absolutely, as long as you can climb up there. Q. You said that we can set traps for the dinosaurs. Can you give us an example? For instance, could you dig a hole, put some leaves over it, and hope a dinosaur falls in? – 2) some players would spend time trying to dig away the whole island! So it’s more like using objects to set up situations — isolate a dinosaur so you can fight it away from its friends, or set up a heavy weight to drop on a dinosaur. Q. Can the dinosaurs destroy buildings? If so, can you use any wood or debris that you find? Say you are in a building and a T-rex realizes you’re in their. What will he do to get you? Will he break through the wall or the roof? – A. It depends on the building; some buildings are brick or concrete, and they’re too tough to destroy. Older buildings are less solid, though, and the T-Rex can break them — he’s usually too dumb to think of any other way of getting to you. And all the pieces are still real, so you can pick them up and use them for things. Q. Can you flip things over, like tables or broken doors? Can you kick or punch anything? Can you push or pull anything? – A. Yes to all three. A lot of our gameplay will be about using things in your environment like tables in new ways — knocking them over, climbing on them, breaking them apart. Q. Are there any high places in which you can look down and see valleys with dinosaurs or something like that? – A. Absolutely — it’s what our outdoor renderer is all about. Q. If a dinosaur dies, will another one “magically” appear to take its place or is there a set limit to how many dinosaurs are on the island? How many dinosaurs will you be able to see at a time? I mean, if they’re in herds, will you be able to see 5, 10, etc? Q. Will you be able to bring down medium to large size trees with your weapons, like the palm trees in “Turok: dinosaur hunter”? – A. Nope — you won’t be issued any Turok-style mega weapons. Just standard 20th-century armaments. – A. We’ve hidden all the sharp objects for your safety:). Damage is based on the force applied, just like in the real world, so the heavier the object you swing and the faster you swing it, or the more powerful the bullet, the more things will get knocked around and the more hurt dinosaurs will become. Q. Will there be specific body part damage (like: shoot a dino through the brain, it dies, shoot it in a leg, it keeps going)? – A. Yup — it should add a new dimension to ranged-weapon combat. Q. How many weapons will there be in the game? Will there be any explosives? – A. A great many — way more than the usual 10. We’re still making ’em, so I don’t know what the total will be yet. Q. Will there be flying dinos? – A. Only if they fall from a great height. No flying species. Q. Will the indoor environments be large or small? – A. A bit of both really, but we mostly focus on the outdoors. Q. You said it will support Voodoo II, But will Trespasser support Voodoo II’s Hardware Bump mapping even though it doesn’t use true phong bump mapping and instead uses a texture mapping technique? – A. No, that’s not the bump-mapping we do. Q. Will you be able to control your other hand? Like for tasks which require use of two hands. Will you have to coordinate them, or will it be automatic.? Q. Will you be able to pull yourself up over a ledge that you cant get on by jumping? – A. Stacking and jumping. Q. If you get attacked by a Dino (raptor) is there a chance you could survive? Q. Will there be “mission packs” i.e. maybe later there will be a mission where Anne has to go back and bring back photographic proof that all the dino’s are there? Or something similar? Q. How well will it support Voodoo2?